Image Size: 38 X 25 in. Image Size: 52 X 34 in. That was only deadly incident with Native Americans during Lewis and Clark’s entire expedition. On their return trip east Lewis and company met a band of Blackfeet on July 26, 1806, in what is now Pondera County, MT. The two groups camped together. Lewis spoke to the Blackfeet of a U.S. Government peace plan to unite the western tribes. He told them the Nez Perce and Shoshone had accepted the plan and would be receiving guns and supplies in return. The Blackfeet recognized immediately the threat to their territory and power that this plan entailed. Late that night they tried to steal the Expedition’s guns and in the fight that followed, two Blackfeet were killed. From that point forward, the Blackfeet treated Americans as they would any other potential adversary. 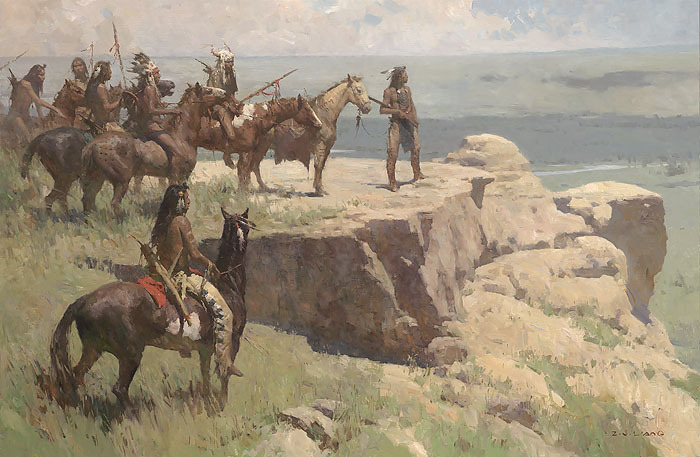 "Overlooking Two Medicine River, 1806" captures the sweeping expanse of the western landscape along with the determined strength of the Blackfeet people. This stunning painting was the centerpiece of Liang’s one man show at Trailside Galleries in the fall of 2011.